A bill from Sen. Diane Feinstein of California incorporates old ideas, and would close loopholes and ban bump-fire stocks. By Ed O'KeefeThe Washington Post. WASHINGTON — It didn’t work after mass shootings at a nightclub in Orlando, Florida, college campuses in Virginia and Oregon, a church in Charleston, South Carolina, or at a movie theater and high school in Colorado. Or after two lawmakers survived assassination attempts. But after a gunman killed 58 people at a Las Vegas concert and wounded many of the more than 500 people who were injured in the attack, Democrats again are making an effort to revamp the nation’s gun laws. Stunned by the mass carnage one heavily armed gunman caused at a country music festival, and frustrated after years of fruitless attempts at gun control, congressional Democrats on Wednesday unveiled new, narrowly tailored proposals and reintroduced old ideas to close loopholes and restrict how gun buyers undergoing background checks can purchase weapons. The fresh push comes at a fractured moment in American politics, where virtually nothing passes Congress and both political parties remain at loggerheads. Democrats believe that the sheer scope of the carnage and pressure on President Trump to act might make this time different. At least some senior Republicans signaled an openness Wednesday to at least discuss changes in gun control policy. As Trump flew aboard Air Force One to Las Vegas to meet with survivors of the shooting Wednesday, Sen. Dianne Feinstein, D-California, unveiled a bill that bans bump-fire stocks, devices that can be purchased online for $200 and make semiautomatic weapons fire like an automatic weapon. At least a dozen of the 23 firearms recovered in Las Vegas were semiautomatic rifles legally modified with bump-fire stocks. Feinstein’s political career is inextricably tied to gun violence, having become San Francisco’s mayor in 1978 after the assassinations of Mayor George Moscone and Supervisor Harvey Milk. On Wednesday, she said that her own personal history with gun violence could have been even worse – her grown daughter had planned to attend the country music festival in Las Vegas but ultimately did not. “I know what guns can do,” Feinstein told reporters. 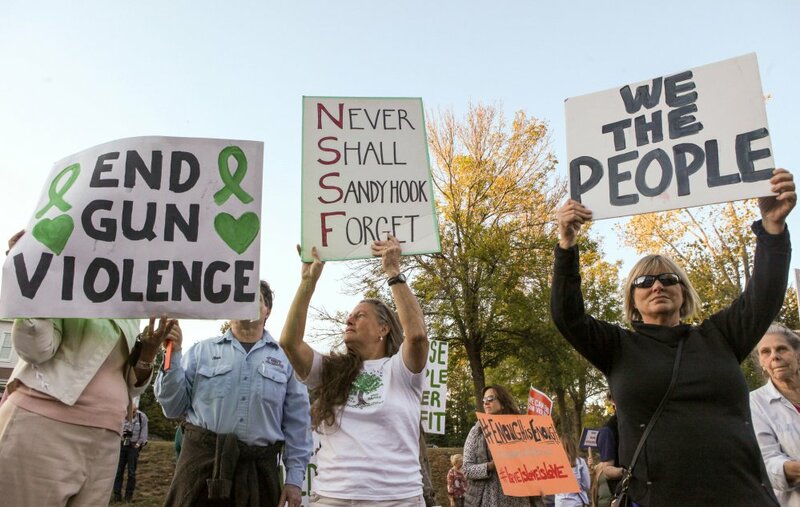 In 2013, after 20 children and six adults were killed in the December 2012 Sandy Hook Elementary School shooting in Connecticut, Feinstein introduced a bill to reinstate a federal assault weapons ban. The measure failed by a wide margin. What Feinstein unveiled Wednesday is copy-and-pasted out of the 2013 bill to focus only on bump-fire stocks and similar accessories. Hunting accessories would still be permitted. She called on regular Americans upset by this week’s events to speak out. Sen. Lindsey Graham, R-South Carolina, agreed, saying: “It’s something I’d be interested in looking at to see if a law change would matter. Would it affect things? I’d be willing to look at that.” But, Graham said, “I’d want to hear from everybody” before making a final decision. Other Republicans indicated that the latest tragedy is not going to change their position. “I think it’s completely inappropriate to politicize an event like this,” Senate Majority Leader Mitch McConnell, R-Kentucky, told reporters Tuesday as he declined to answer questions on the subject. The National Rifle Association, the nation’s most prominent gun rights organization, did not have immediate comment on Feinstein’s legislation and has remained publicly silent since Sunday’s mass shooting in Las Vegas.